Donating Breast Milk: Erin A's Story Mama Say What?! | Mama Say What?! As a follow-up to my post, Donating Breast Milk- A Mama’s Gift to Mamas and Babies, I wanted to interview a few mamas who’ve had personal experience donating breast milk. My goal was to find out how the process of becoming a donor actually works and share this information with you, our MSW readers. Erin A. is a working mama of two boys, a toddler and a preschooler. In her free time she enjoys fitness classes in the Kansas City area to help her reach her physical and emotional wellness goals in order to be a better wife, mother, and colleague. How did you find out about breast milk donation? Did you donate through a Human Milk Banking Association of North America’s (HMBANA) milk bank? I heard about donating breast milk through a friend who had looked into it. She was done nursing her son and hated the thought of throwing her frozen milk away. I was not one of those people that had an oversupply of breastmilk. I had a lot of supply issues with my son and worked really hard pumping several extra times a day to work on making enough to feed him. All of that extra pumping paid off and I had built up a small stash of excess breastmilk. I loved the idea of being able to give my extra breastmilk to a baby in need. I donated through Saint Luke’s Heart of America Mothers’ Milk Bank, a member of the Human Milk Banking Association of North America, which serves the Kansas City metropolitan area. I contacted the milk bank to learn more about the donor criteria. I then went through a multi-step screening process that started with a ten- minute phone call for their initial screening. During the phone call for the initial screening, I was informed the milk I had saved could not be accepted through the milk bank because I had been taking herbal supplements to increase my milk supply (fenugreek and blessed thistle). We discussed how if I was willing to stop taking these herbal supplements, I could donate any breastmilk after that to the milk bank. The woman who I spoke to was very helpful and made it clear that any decision I made was the right decision. Once I decided to stop taking my herbal supplements, I then filled out several forms to find out if I qualified as a donor. 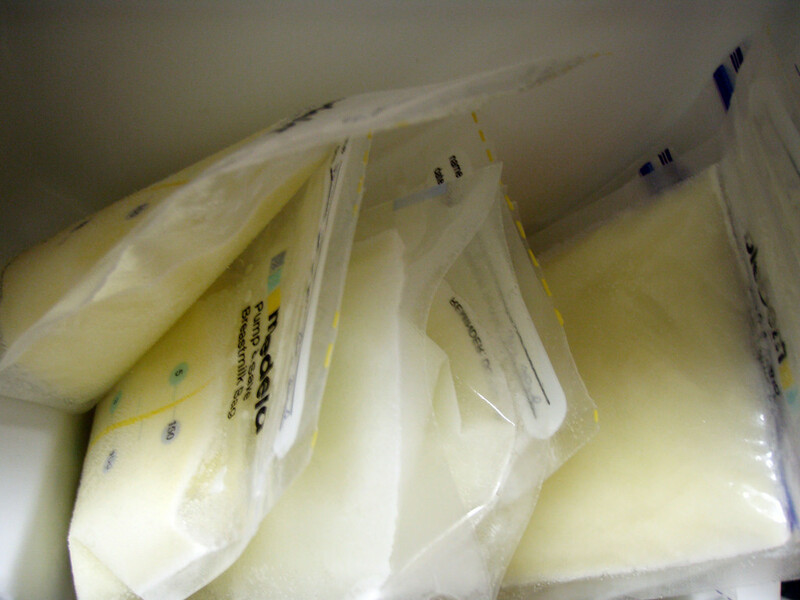 After I stopped taking the supplements, I began to send my stash of breastmilk to daycare with my son and froze the breastmilk I pumped for donating. Potential donors must also have blood drawn to test for HIV, HTLV (human T-cell lymphotropic virus), Syphilis, Hepatitis B, and Hepatitis C. When a mama qualifies as a donor, the milk bank is able to accept milk until the baby turns one year old. They ask for the first donation to be a minimum of approximately 150 ounces. I did not test my own milk. The milk bank completes the test on my donated milk. I arranged a time with the coordinator of the milk bank. I packaged my milk according to their instructions and put it in grocery bags, tied shut with my name on the outside of the grocery bag, and transported it in a cooler to the hospital. The coordinator met me outside of the hospital with a cooler to transfer my milk. She gave me a quick tour and then we headed to the lab to get my blood drawn. It was a simple and quick process. I don’t know that I would have changed anything. The milk bank is great and really tries to make it as easy and convenient as possible. I only wish I had looked into this process with my first son. It took some time to file the application, get my blood tested, etc. BUT knowing the milk went to babies who needed it made it all worth it. I was able to donate 225 ounces of breastmilk total. Breastfeeding my children was one of the most fulfilling and rewarding parts of motherhood during the first year, and I am happy knowing that my milk was able to help others. Added by Sarah K. on January 30, 2017.